Preparing to increase headcount at a large organization is like comparing the cost of bread at different supermarkets: At your regular neighborhood store, a loaf might cost $2.28, but at a high-end store, a loaf might cost $3.98. In a similar way, wages for workers with the same title can vary dramatically based on location. According to Salary.com, in San Francisco — where the cost of living is very high — the annual salary for a customer service representative is $42,526 (24% higher than the national average). In Harlingen, Texas — one of the most affordable places to live in the US — the salary for the same role is $30,179 (12% below the national average). It is easy to see how, if you need to hire 100 people or more, focusing on a low-cost location could easily yield significant cost savings, something that is important for budget-conscious organizations. But efficiently determining the most cost effective solution is often easier said than done. Let’s say you are a workforce planner for a large corporation and a business leader comes to your team with a problem. In order to support an expansion, she is looking to grow the headcount of customer support representatives by 100 by the end of this fiscal year. However, she does have a strict budget goal to meet and thus, needs a creative solution to increase the headcount within budget. This puts you in a bit of a double bind: If you spend too long researching labor costs and other key elements such as regional labor laws, you may miss your window of opportunity to present your recommendation to the executive team. On the other hand, if you don’t take the time to consider your cost options and other requirements, you may end up spending more money than is necessary. Your headcount requirement has been made clear: Increase the number of customer support representatives by 100. But to ensure you are working strategically, you need to understand how this expansion supports the business strategy. A customer service representative in the San Francisco Bay area may cost up to 24% more than the national average, for example, but if the business strategy hinges on having key people based in this particular geography, you need to be prepared to pay more. Or perhaps your company is expanding its e-commerce focus and wants to place more people in remote, low-cost locations. The key here is to connect with relevant stakeholders in the business to have a clear understanding of how your talent will support your business goals. This will give you the right context within which to analyze your data, a key component of strategic workforce planning. (To learn more about strategic workforce planning and get some real-world best practices, check out this post). Small differences in cost get amplified on a bigger scale: Spend an additional five dollars on a bottle of wine for you and your spouse, and you won’t break the bank. However, do the same when you are hosting a wedding with 150 guests, and it may be a different story. In the same way, when you are headcount planning for a large organization, getting a robust picture of cost is key. This is where you need to know your Total Cost of Workforce (TCOW), which is the full cost for people who contribute work to the organization, including all of the labor costs and the workforce overhead costs. This lets you take a very targeted approach when making decisions about where to increase headcount. Once you have your TCOW, you can break it down by location to identify which locations are low-cost in terms of talent. Of course, cost is not the only factor to consider at this stage. Talent acquisition concerns will also come into play. Connect with recruiting to get an understanding of quality-of-hire, as well as speed-of-hire, for specific locations. If one low-cost location turns out to not be viable in terms of its talent pool, you can remove it from your list. Without a clear vision for multiple future states, it can be difficult to identify what different changes will mean to your business. Therefore, it is important to develop multiple scenarios to help you generate different headcount strategies for achieving organizational goals. Scenario 1: Hire 100 new customer support reps across all locations within six months. Scenario 2: Hire 100 new customer support reps in low-cost locations only within six months. In the first scenario, the headcount distribution is based on the proportions in your existing population — larger teams may get more, smaller teams may get fewer, or no additional headcount. In the second scenario, your headcount target is the same, but you are being more strategic, applying the 100 reps to the low-cost locations only. Information is often spread across the organization in siloed systems within various departments and is difficult to aggregate and reconcile. This makes it hard to create one plan, let alone multiple. 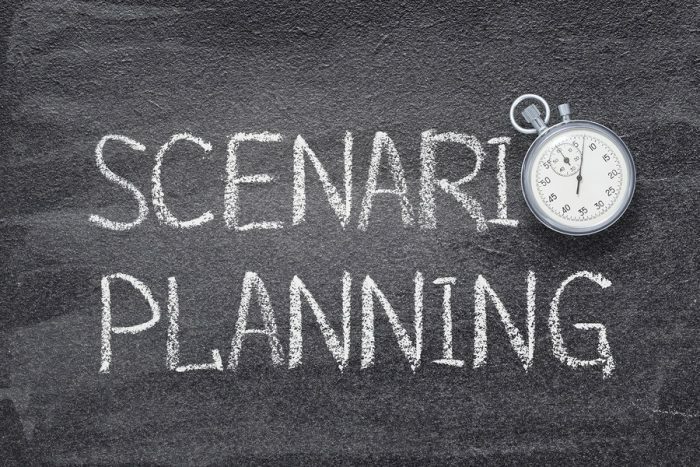 To make this process easier, you can look for technology and tools that allow you to create and compare different workforce planning scenarios (each with different workforce movement and cost assumptions). In this step, you look at your cost scenarios side-by-side to see which strategy is best. Visualizations, such as bar charts providing a comparison of headcount with a breakdown by city, will allow you to see the cost differences more easily. At this point, you may decide that your organization needs to hire in specific low-cost locations to help meet the budget goal. You can then use these visuals to tell a compelling story to business leaders when making this recommendation. But seeing the headcount distributed this way may trigger some additional questions: If we are favoring one location in terms of new hires, how will this impact productivity and morale? Does this distribution map back to our business goals in terms of the new markets we need to serve? To answer these questions, you may need to dig further into your people data or refer back to the business strategy. This is where a technology solution that allows for dynamic interaction with the data can be a significant boon. When dealing with a large, distributed workforce, it can be difficult to clearly see where cost-savings can realistically be achieved, while also maintaining productivity. But when workforce planners can rapidly develop multiple data-driven scenarios that balance cost and talent issues, HR leaders — the people experts — can take the lead on important business priorities, like an expansion. By using this approach, what may have once been a regular source of frustration may even become an interesting and rewarding process. Cindy is an HR professional with a passion for people analytics. From crown corporations to ship building companies, she was a key partner in programs which enabled leaders to make critical decisions for their workforce. As a Workforce Planning Consultant at Visier, Cindy is excited to work with customers to implement Workforce Planning for their organization.